Sharp 4 bedroom colonial home nestled in one of the most desirable locations within walking distance to downtown Utica... while closed to shopping, restaurants & highways for an easy commute. Welcoming entryway that flows into the spacious but comfortable family room, which connects to the bright dining room. Recently updated kitchen featuring all appliances, solid white cabinets, modern ceramic tile 24x12 tile floor & breakfast bar that overlooks the cozy living room complete w/stately fireplace & doorwall to the private backyard. Four nice sized bedrooms upstairs, along with the main bath w/ceramic tile and modern vanity. Awesome finished basement complete with home theater/gaming area, toy area for the kids & bar area for the adults. Newly landscaped exterior features an oversized driveway and attached 2 car garage w/access to the private, fenced backyard. 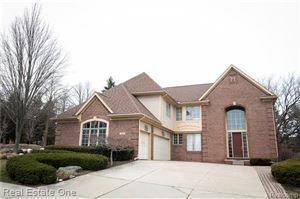 Highly sought after schools & community... this home features size, finishes & location rarely found at this price point! The data relating to real estate properties on this website was last updated as recently as 4/23/19 3:45 PM PDT.